Marc Potts is national criterium champion for 2017 having won the title race at Limerick Race Course this evening. Potts was out on his own at the end of one hour plus three laps event. He won from Paul Kennedy and James Davenport. Going onto the last lap, Davenport (Strata 3-VeloRevolution) led from Potts (Neon Velo) by a few lengths. And six seconds behind the two leaders came Paul Kennedy (Newcastle West), one of the revelations of the last couple of seasons. There was then a long gap of about 30 seconds back to long time leader Simon Ryan (Strata 3-VeloRevolution) and top junior Ben Walsh (NRPT-Titan Containers). Just behind that pair was a group of 10, though on the short lap the race for the medals was already over. Potts would press on alone up front to take a very clear win, with Kennedy beating Davenport in the sprint for silver 18 seconds later. Defending champion Mark Dowling (Strata 3-VeloRevolution) would take 4th a couple of seconds clear of a group of 20 sprinting for 5th. Strata 3-VeloRevolution would take the team prize after imposing themselves all evening. New champion Potts is hitting some very good form, with place of racing at home and abroad still to come in the current campaign. 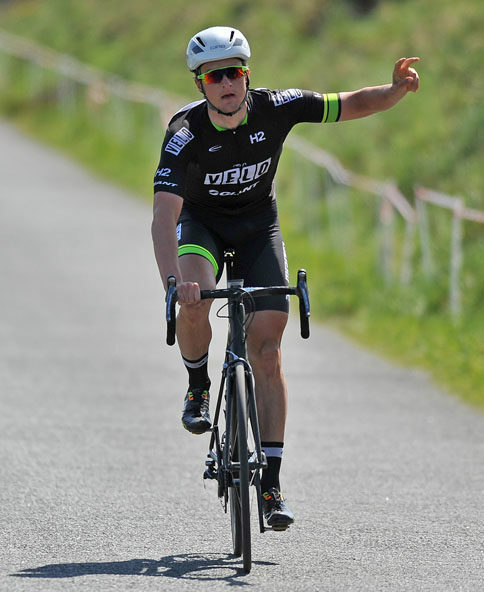 As well as adding an Irish title to his palmares this evening, he took the Ulster road race crown last weekend. He won the provincial title in Cranford, Co Donegal, at the weekend. He took victory from Craig McAuley (Caldwell Cycles Omagh) and Ronan McLaughlin (Aqua Blue Academy).